My grandmother was born in 1934. She lived through the depression, through World War II, and through two husbands. She was the toughest woman I knew. She was progressive in every way, working two jobs while raising her children, embracing diversity, and even fighting in her own way for women’s rights. Yet, on my wedding day she whispered into my ear, “You better watch your figure honey, you don’t want to lose your husband.” On her deathbed, while we sat watching her fade from us, she yelled at me when I snuck a piece of nearby fudge past my lips. For her, and millions of women like my grandmother, weight and body shape was a defining characteristic of a woman’s worth. Where did she ever get such an idea? When we think of revolution, we think of Martin Luther King JR. bravely leading people in the streets of Birmingham, we think of college students planting daisies down the barrel of a gun, courageous young men and women staring down tanks in Tiananmen square, or children marching with their parents on the streets in Baltimore, but for those fighting the war on body image, the struggle isn’t always so obvious. The war on body image is fought behind closed doors, in dressing rooms, closets, bathrooms, and in the darkest corners of our society. It is a war that has claimed many lives and will continue to do so as it rages, a war rooted in self-hatred and self-loathing, born out of the media and pop-culture’s idea of what it means to be beautiful. Beauty pageants, swimsuit calendars, “thigh gap,” for longer than we care to admit, Americans have allowed our children- girls and boys- to participate in a culture where they are rewarded for how they look rather than their strong minds and hearts. Thankfully, the body positivity revolution has begun. What was once a whisper, is quickly becoming a roar. With the strong voices of Lena Dunham, Adele, Amy Schumer, and more, there has been a real push as of late to reclaim beauty in a world where that word-and everything that goes with it-has been hijacked. Pageant viewing has declined, pushing what was once a staple of American culture-The Miss Universe, Miss USA pageant and others-to a basic cable timeslot where they garner a third of their once enormous audiences, companies like Lane Bryant are launching campaigns like #ImNoAngel to promote self-love and body acceptance, and more recently Sadiq Khan, the new London mayor, banned advertisements promoting unhealthy body image. Now more than ever, women of every shape and size are now on our television screens. In the world of literature, there has been an explosion of books dealing with this very issue. Memoirs from women who were once or still are struggling with weight. Books like It Was Me All Along by Andie Mitchell, Big Girl: How I Gave up Dieting and Got a Life by Kelsey Miller, Things No One Will Tell Fat Girls by Jes Baker, and the highly-anticipated Hunger by Roxane Gay due to be released this summer, are climbing the New York Times Bestseller list and quickly. Yet, there is still work to be done. According to the National Eating Disorders Association, 20 million women and 10 million men will suffer from a “clinically significant” eating disorder in their lifetime. As if that number isn’t alarming enough, the organization reports that by the age of six, 40-60% of young girls worry about their weight. Something must be done. My Body, My Words brings a chorus of strong voices to this fight. With contributions from writers like Beverly Donofrio (Riding in Cars with Boys), Martha Frankel (Hats and Eyeglasses), Abigail Thomas (What Comes Next and How to Like It), and more. 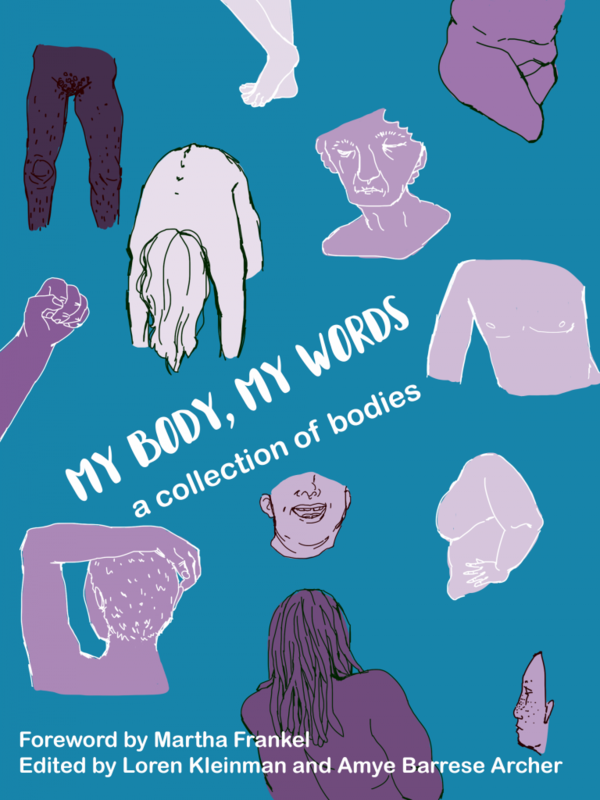 My Body, My Words will offer readers and educators the unique experience of finding all of these voices in one place. We’re donating 50% of the proceeds from the sale of My Body, My Words to the Geena Davis Institute on Gender in Media. We chose the Institute because they’re one of the few organizations challenging the media and entertainment industry’s representation of body image and identity.